Slimming World is backing a Cancer Research UK campaign that aims to raise awareness of the links between obesity and cancer. The charity’s latest research highlights how being overweight or obese as an adult is linked to 13 different types of cancer, including breast, bowel and kidney cancer. The charity found that despite being linked to 800,000 cancer cases per year, only 15% of people in the UK are aware of the correlation. Cancer Research UK is Slimming World’s national charity partner and Slimming World has raised more than £10million for the charity since the partnership began in 2013. 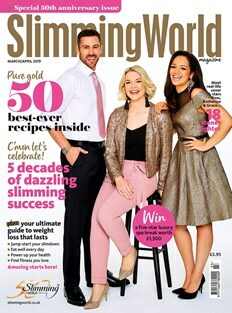 The Big Slimming World Clothes Throw celebrates weight loss success by inviting Slimming World members across its 16,000 groups to donate the clothes they have slimmed out of – and they know they won’t need again – to Cancer Research UK shops. The organisation first ran this campaign in 2013 and was thrilled when it raised almost £900,000. Since then it has captured the imagination of members and Consultants alike and raised £3.3 million last year. For 17 years a Slimming World team of members, staff and Consultants have entered the London Marathon and for the past five years the team has raised money for Cancer Research UK. For many of the runners, before their weight loss even climbing the stairs was a huge struggle. Many never would have dreamed they’d run a 5k distance event, never mind one of the most famous marathons in the world. Slimming World also supports Cancer Research UK through annual community activity events including Slimming World does Race for Life, which ran for several years, and the new Slimming World does Walk All Over Cancer. These events invited Slimming World members to build up their activity levels together. The support and encouragement of their fellow members in group and the motivation of getting sponsored by family and friends helped many slimmers to use the event as a first step to a more active lifestyle. Both organisations remain dedicated to raising awareness of how keeping a healthy weight reduces the chances of developing the disease. Slimming World was founded by Margaret Miles-Bramwell (OBE, FRSA) in 1969. There are now more than 18,000 groups held weekly across the UK and Republic of Ireland via a network of 4,000 community-based Slimming World Consultants, who receive specific training in the role of diet and physical activity in weight management, as well as sophisticated behaviour-change techniques. Slimming World’s healthy eating plan, Food Optimising, is based on the science of satiety and energy density. Our phased activity programme, Body Magic, eases members into activity until it becomes an intrinsic part of their daily routine. The principles behind Slimming World’s philosophy are based on a deep understanding of the challenges faced by overweight people and a recognition that those who struggle with weight carry a double burden, the weight itself and a burden of guilt and shame about their weight. Slimming World’s programme integrates practical, up-to-date advice with a highly developed support system based on care and compassion, and Consultant training focuses on facilitating behaviour change in a warm and friendly group environment. Consultant training is delivered through the Slimming World Academy. Slimming World also invests in a comprehensive research programme to develop its support for long-term weight management. The group support provided by Slimming World is recognised as effective by the National Institute for Health and Clinical Excellence (NICE) and the NHS. For more information about Slimming World’s approach visit www.slimmingworld.co.uk or call 0344 897 8000.